We always take part in a Cadbury's egg hunt over Easter, usually at Seaton Delaval Hall. This year though we decided to visit somewhere new and try Washington Old Hall which is about a thirty minute drive from our home in Northumberland. We certainly picked the right day for it and spent four sunny hours at the Hall enjoying the gardens, searching for chocolate eggs and playing games on the lawn. Running around outside all afternoon certainly builds up an appetite and as the sun started to hide behind some clouds a quick google led us to the newly refurbished River Bar which was less than a 2 mile drive from the hall. Sliders, shakes and burgers sounded good to me. As we entered the bar my first thoughts were it's not somewhere you would necessarily describe as child-friendly and I couldn't help but feel a little jealous of the groups of friends who were working their way through the River Bar's impressive cocktail list. There were other families there though and I was assured that children are welcome until 9pm. We managed to grab a couple of sofas (most people were taking full advantage of the weather and drinking/eating outside) and contemplated the menu. There isn't a separate children's menu but this doesn't really put me off. 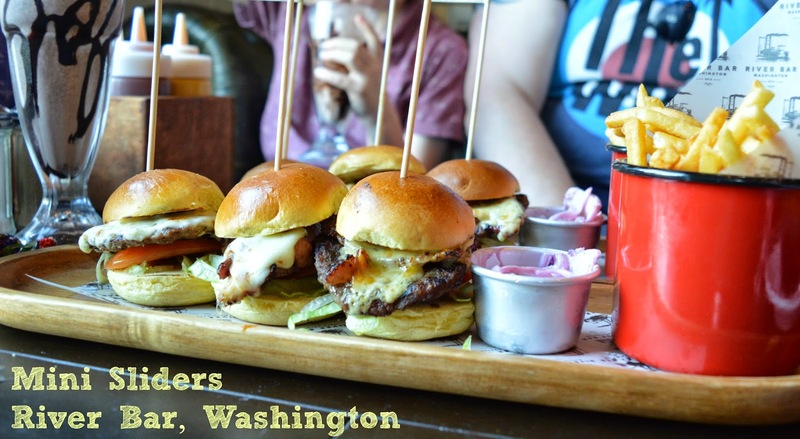 My children aren't particularly fussy and we decided to order a few plates to share - two lots of sliders, fries, garlic bread and milkshakes all round. 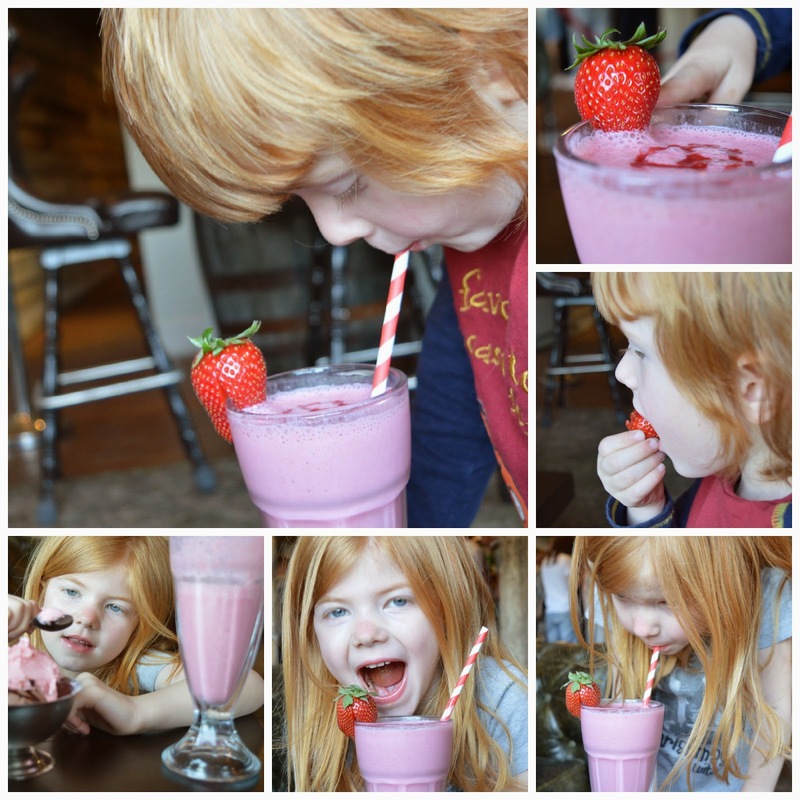 Our milkshakes were a real treat - made with fresh strawberries and ice cream they certainly kept our children happy. Hubby had been given the designated driver role so I decided to push the boat out and order a 5 dollar shake. As a pulp fiction fan there is no way I could turn one down. It did not disappoint either and certainly tasted as though they weren't scrimping on alcohol measures! I can't hide the fact that I was over the moon to be in a grown up bar on a bank holiday Monday drinking a cocktail. Happy days! Our food arrived within 10-15 minutes before we had a chance to finish our drinks which was impressive. Speedy service is important when dining with kids! All of the staff were very accommodating and brought us extra plates and napkins without being asked which was nice. Our food was just what we needed - six sliders, a mountain of sweet potato fries and a portion of garlic bread was more than enough between the five of us. I have to say I have been spoilt with burgers and I think perhaps once you have tasted a fat hippo nothing else will compare? I like my burgers slightly pink and juicy which these ones were not. That being said, they were still delicious and didn't last long as we all tucked in. River Bar burgers are made in house with 100% Aberdeen Angus beef and lightly smoked with Hickory and Maple woods. The addition of four types of sauce on the table certainly made them more interesting too. There were two real stars that will make us return to River Bar sooner rather than later - the Chicken New Yorker slider was outstanding. The chicken had a hint of charcoal about it and almost tasted BBQ'd yet still managed to stay lovely and succulent. Next time I'll be ordering full size. The sweet potato fries were the other reason I will return - they were perfectly seasoned, hot and crisp and we all couldn't get enough. I feel the same way about these fries as I did when I first tried Polenta chips from Jamie's Italian. They are life changing and I'll no doubt try (and fail) to re-create them at home in the near future. We couldn't fault River Bar at all. If your children are either very small (ie still a baby) or at the age where they don't need to run around constantly and cause havoc in a restaurant then this place is certainly somewhere to try. Our children are aged 4, 6 and 8 and we all loved the food and enjoyed ourselves. The location of this bar is (as their name would suggest) by a river. We spent 5-10 minutes watching the ducks on the river bank after our meal which our children found highly entertaining. 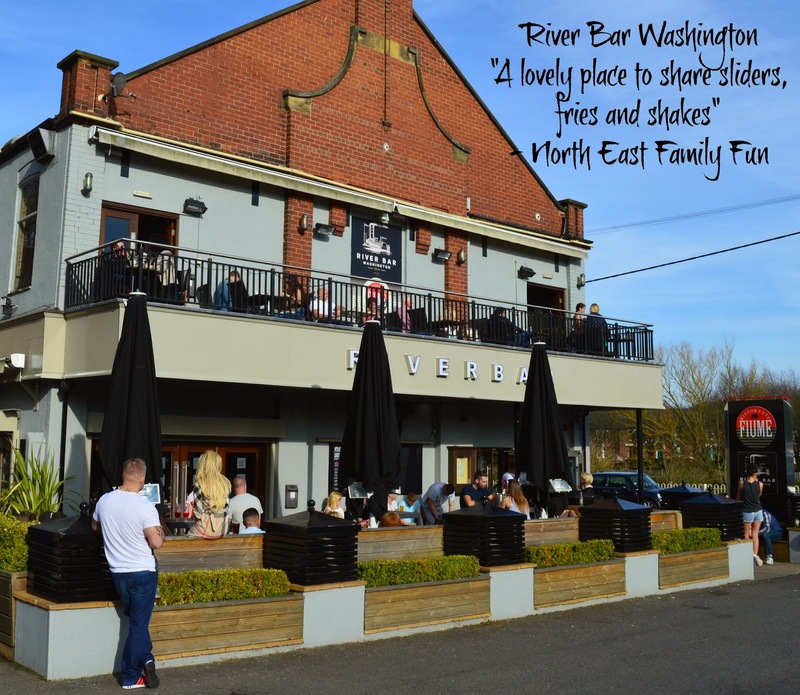 The bar is within 5 minutes drive of Penshaw monument, Herrington Park, Washington Wetland Centre and Washington Old Hall making it the perfect place to stop and re-fuel after a day exploring the area. 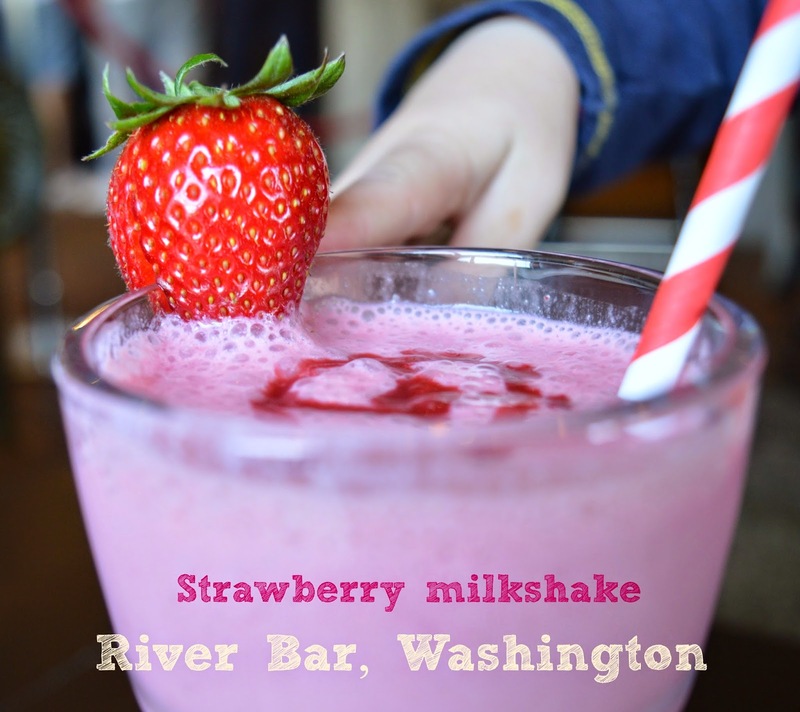 I have a feeling Simon may love River Bar .. burgers and milkshakes - his idea of heaven! The shakes made with fresh fruit sound really beautiful! and a beer garden with lots of space too! I used to underage drink here when I was 16. Certainly didn't look like this when I went haha! sweet potato fries were definitely a winner! Looks fantastic. Will definitely have to check it out!! Sounds interesting & the food looks nice too. The milkshakes were fab - kids loved them (as did I). Sweet potato fries look delish, not somewhere I would think of going but maybe one day!